It’s Lent. And if you are Catholic and reading this, you really don’t even need to read on…just make the soup tonight or next Friday or the Friday after next. If you one of those non Catholics (shame shame) then Lent is just a time you can pick out a Catholic a mile away. We don’t eat meat on Fridays…I suppose it is to make up for all of our other sins, though how it does I am not sure. Or it is supposed to be a sacrifice of some kind, in addition to what we “give up” for Lent. Making and eating this soup is not a sacrifice or an atonement of any kind for the endless sinning one does yearly because it’s f–king delicious. My annual give up for Lent is swearing. My kids love this time of year, watching me try to not expel obscenities from my mouth, something that I have turned in to an art form, is truly one of the highlights of their year. And it never works, and we have a Lent box, where every time we break our Lenten promise we have to put money in the box and we donate the proceeds every year to Catholic Charities. They are extra proud to march in to church with an exploding box of cash claiming “our mom tried to stop swearing for lent, here is a bunch of money cause she couldn’t do it.” I need the lent box back to buy groceries the following week, f–k me. Good times. 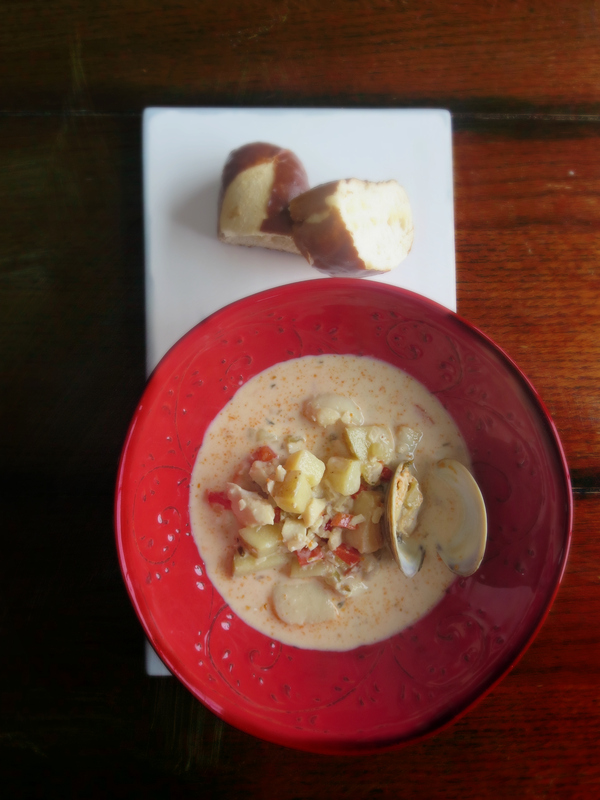 This seafood chowder is a delicious option for Catholics and non-Catholics alike. 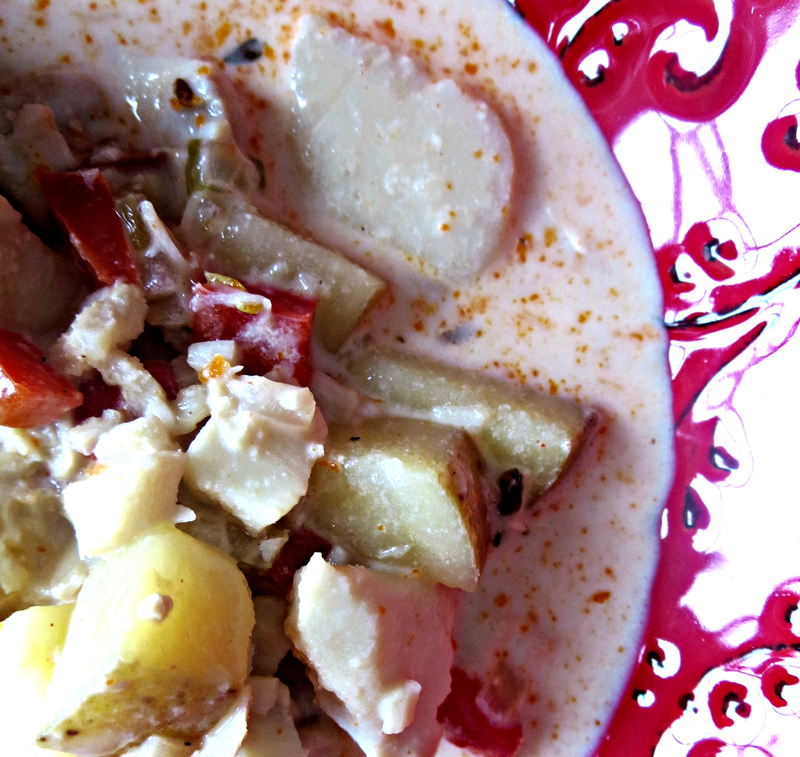 I made this up as I went along, combining all things I love in a good chowder (except the bacon and bacon fat, cause well…). I made it last Friday for the man who is what I call a super Catholic as he didn’t even want me to cook the vegetables in bacon fat, there must be an extra special spot in heaven for him. Don’t be alarmed by the mix of seafood, just use fresh and USE REAL CLAMS, not the clams in the tuna aisle (those are gross), the clams in the seafood section of the butcher. It makes a huge difference. These are all mild in taste and texture and the dish is not fishy at all. Also if you don’t think there is a special place in heaven for you, then cook in bacon fat and butter, not olive oil and butter. The bacon fat adds an extra saltiness, and this dish needs a lot of salt. In a heavy stock pot or Dutch oven heat oil and butter, add vegetables (except for the potatoes) and thyme to sauté until onions are translucent, seasoning them with a little salt and pepper. Add tomato paste, paprika (both kinds), parsley, allspice, Italian seasoning and a lil more salt and pepper, and cook for about three minutes to lose the raw tomato taste and blend in to the vegetables. Pour in the wine and cook on high til it is evaporated almost completely and then add both stocks and the milk. Bring to a simmer and add the potatoes a lil more salt and pepper (the idea is to gently season every layer to get a proper seasoning) and simmer covered until the potatoes are fork tender. When potatoes are tender, add the cod and scallops to the soup and continue to simmer for about six or seven minutes, then add the clams and simmer, covered until the clams have opened up. The fish does not go in all at once, clams do not take that long to open up, and once they are open, they are done and if you keep it up they will turn to rubber and are gross, so be mindful of the timing for the fish. Add the cream at the end an turn off the heat. Stir in together and taste it, and salt and pepper additionally until you think it is perfect.